BoBunny always creates amazing collections and we all love how perfectly everything coordinates! It makes creating so quick and easy. However, did you know that many of their collections are perfect for mixing with other collections? Our theme these week on the blog is Mix and Match and we are going to show you how easy this is to do. 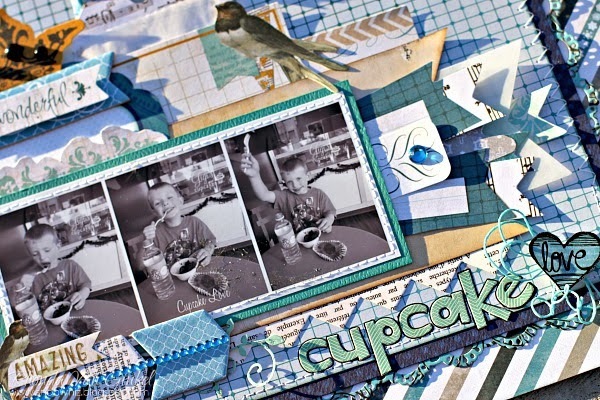 Today, Tracee and Rhonda have each created a scrapbook pages with a mix of different BoBunny collections. The number of different collections that they have each mixed and matched together is seriously amazing! Can you name them all? 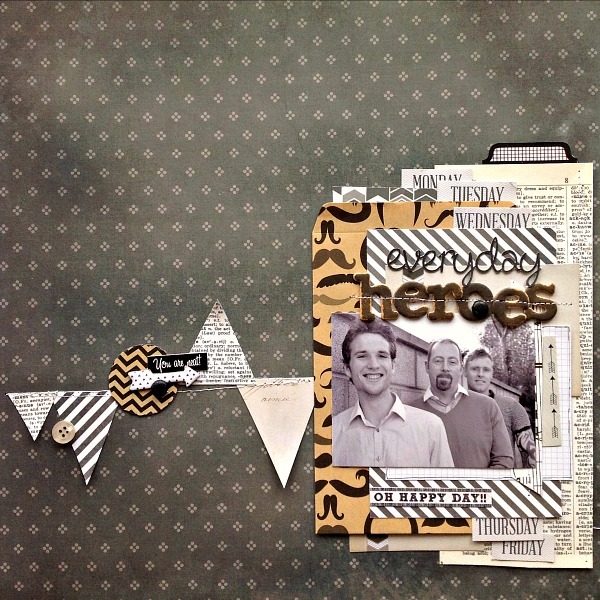 I knew I wanted to create a masculine layout, so I pulled elements from five different collections. 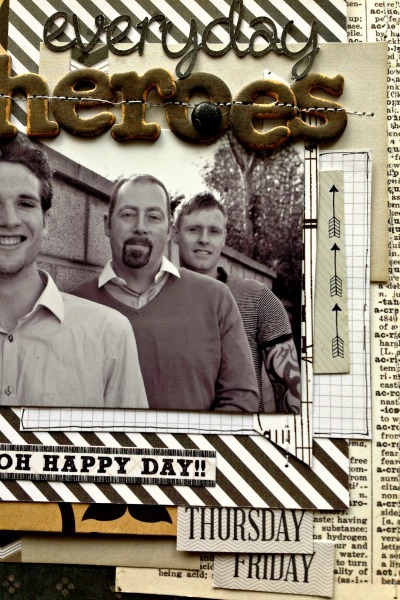 I used Pincushion, Woodland Winter, Zip Dee Doodle, Elf Magic and Kraft to show off this great photo of the Everyday Heroes, aka the men in my life, my Husband, my Son and my Son in-law. I usually lean towards a light colour or white background, but this Handmade paper from the Pincushion collection has a slightly distressed look and made a great darker background that makes the other papers pop off the page. In the Kraft collection Gift Bags you also get a sheet of 6 patterned circles I added one along the banner to create a journaling spot. I used a variety of stickers from different collections. The days of the week are from the Christmas collection, Elf Magic and the others from Zip Dee Doodle. I used a black ink pad and dabbed over the chipboard alphabet from the Avenues collection, this left a small amount of the original colour to make a contrasting edge to the letters. The Kraft Gift Bag has a fun moustache design and I also used it to create a pocket for some hidden journaling. I used some Double Dot and pattern papers from The Avenues, Woodland Winter and Zip-A-Dee Doodle collections. The fun photos are from a cupcake date that I took our oldest on and as you can see, he more than enjoyed his special treat! The chipboard arrows are from Woodland Winter, the alpha and love sticker is Zip-A-Dee Doodle. 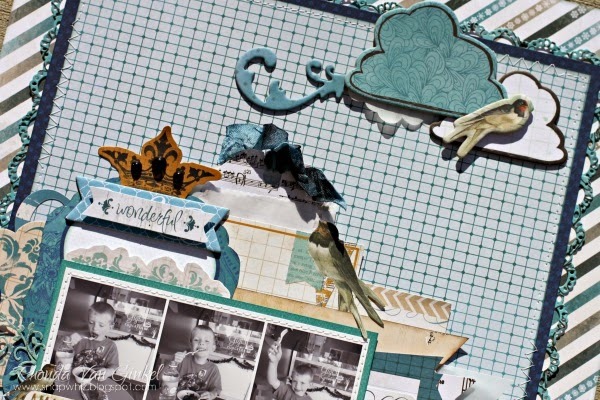 The chipboard clouds are from Zip-A-Dee Doodle, the bird from The Avenues. I used quite a bit of Noteworthy items and stickers here. The large Woodland Winter bracket sticker on the left is tucked under some Noteworthy and fussy cut Zip-A-Dee Doodle Collage paper. I used a glassine bag to hold my ticket from Woodland Winter and also cut one of my little clouds from it. You'll notice a flag layer of vellum under my flags to the right of the photo strip. I just love how all of the BoBunny collections coordinate so beautifully!!! What a beautiful pages! I loved it! These lay-outs are totally amazing! You did an amazing job mixing and matching collections. These are amazing ladies!!! Love the mixing and matching!!! Fabulous pages - both of them! Really pretty LOs! Mixing and matching is so fun!